Pierre-André Valade was born in France in 1959. In 1991 he co-founded the Paris based Ensemble Court-Circuit of which he was Music Director for 16 years until 2008. He was Principal Conductor of Athelas Sinfonietta Copenhagen from 2009 to 2014. He currently has an active career as a guest conductor whilst continuing his relationship with Athelas Sinfonietta Copenhagen as a regular guest conductor. 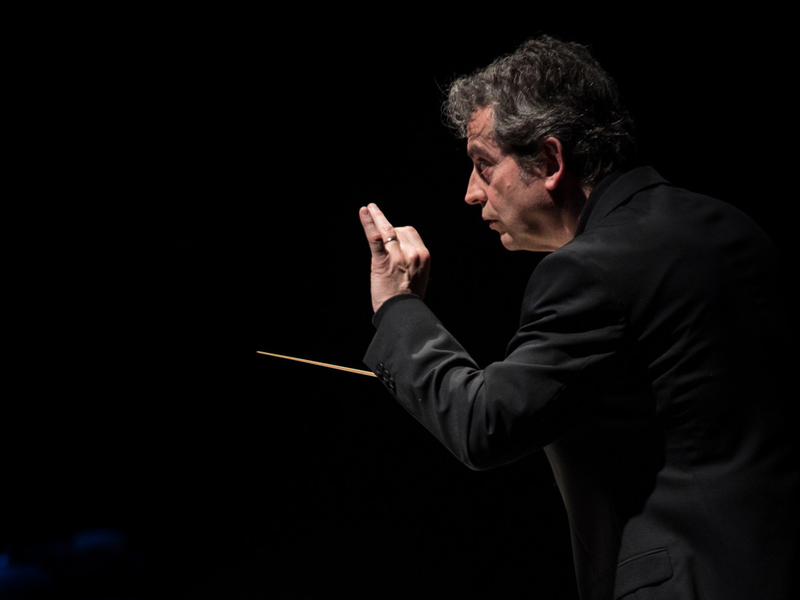 He was also appointed Principal Guest Conductor of Lyon based Ensemble Orchestral Contemporain in 2013 and has held the position of Conductor in Residence at the Meitar Ensemble in Tel-Aviv since 2014. He is especially admired for his performances of repertoire from the 20th and 21st centuries, and receives regular invitations from major festivals and orchestras in Europe, the USA, Canada, Australia, New Zealand and Japan. Of his many recordings, Grisey’s Les Espaces Acoustiques has been singled out for particular praise and won both the Diapason d’or de l’année 1999 and the Grand Prix de l’Académie Charles Cros, which he won again in 2008 for three other recordings. His more recent CDs include works by Hugues Dufourt (winner Diapason d’Or and Choc du Monde de la Musique), and Harrison Birtwistle’s Theseus Game for Deutsche Grammophon, a piece he premiered in Duisburg and conducted at the Southbank Centre, BBC Proms, Huddersfield Festival, Lucerne International Festival and in Berlin. In 2014 he made his debut with La Scala Orchestra in Milan. He also conducted in 2014 several concerts as a tribute to Witold Lutosławski, including a concert with the Polish National Radio Symphony Orchestra which was chosen to be published on the CD of the Lutosławski Jubilee Concerts. In 2018 he appeared among the greatest conductors on a CD box of 14 discs released by Sony Classics and tracing 150 of history of the marvellous Tonhalle Orchester Zürich. A regular guest conductor with the Tonhalle Orchester Zürich, other orchestras include BBC Symphony, BBC Scottish Symphony, Scottish Chamber Orchestra, Philharmonia, Ulster, RTE National Symphony, RTÉ Concert Orchestra, Göteborgs Symfoniker, Orchestre Philharmonique de Radio France, Montreal Symphony, Seoul Philharmonic, Tokyo Philharmonic, Orchestra della RAI Torino, Accademia Nationale di Santa Cecilia Rome, Teatro Carlo Felice Genova, Ensemble Intercontemporain, London Sinfonietta, Birmingham Contemporary Music Group, Bit 20, Bodo Sinfonietta, Contrechamps Geneva, the Asko Schoenberg Ensemble, I Pomeriggi Musicali, Bilbao Symphony Orchestra, Polish National Radio Symphony and the Philharmonia’s Music of Today series, Ensemble Modern, Ensemble Musikfabrik. He conducted his BBC Proms debut in 2001, and has also appeared at the Aldeburgh, Bath International, Holland, Strasbourg Musica, Oslo Ultima, Monte Carlo Le Printemps des Arts, Nice Manca, Paris Ircam Agora, Ircam Manifeste, Radio-France Présences, Perth and Sydney festivals. In January 2001 he was awarded Chevalier dans l’Ordre des Arts et des Lettres by the French Minister of Culture.